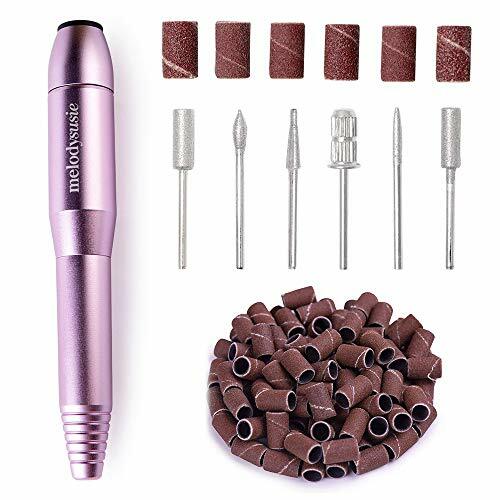 Professional Nail Drill - Bring a Professional Manicurist Home! What makes our Professional Finger Toe Nail Polishing Kit special? 1.With SIX drill bits and various polishing speed that are gentle on your nails, it make easier to manicure your nails but no hurting. 2.You will not be disturbed by the sound of the polishing as our nail drill is quiet and low noisy. 3.It is light-weight designed and operated with a power supply. You will enjoy the benefits of a professional salon care - minus the cost and time. 1. This nail drill is doesn't have to be charged. Connect the Nail Drill with the power supply. There is a sliding switch on the power line for you to turn the drill on/off. 2. If the nail drill stopped working suddenly, please make sure whether the power supply is good connected with the power. 3. There is a sliding speed control on the power line. You can slide it to accelerate or decelerate the rotating speed of the machine. NOTICE: This Nail drill is not chargeable. It need to be plugged in with the power supply. At MelodySusie, we guarantee product quality as we have highest standards of quality testing. That's also why we promise full 12-month warranty and provide friendly, easy-to-reach support in any times. *Only buy it from MelodySusie to get authentic quality product and to qualify for full after-sale service. MelodySusie offers six-month limited warranty and free replacement service.Please do not hesitate to contact us if you have any problem or concerns, we will gladly to get back to you and assist. 1)Can be used with various kinds of nail beauty products, such as builders UV gel led gel etc. 2)99s low heat mode relieves you from pain when curing gels, has no harm to eyes and skin. 3)Suit for Salon or home use .Enjoy your nail art work at anytime and anywhere. 4)3 timer buttons:30s 60s 99s,meet various curing demands. If the adapter connector you received have any problems,please let us know and we will send you a great one again! Safety and Fast Dry: 40W High power Gel nail uv led lamp with 21pcs led lights,110-240 voltage,Fast Dry also can prevents browning of your skin. 50,000hours Life Time:3 Timer With Sensor 30s,60s,99s with led display,Different time for different gel in order you control the time. 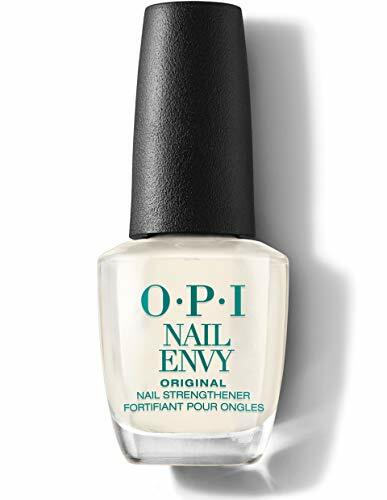 Application :Most Nail UV gel,UV top coat ,UV Builder gel, and led nail gel.But can't dry the regular nail polish that no contain ultraviolet gel. Low Heat With Sensor:Non-closed design will dissipate heat rapidly.Smart touch with ,Put your hand in curing lamp and the LED lights will automatic lighting. Guarantee 24hours online service,12month warranty.if the adapter that you received has any problem,please contact us,we will send you a new one for free. This product is a professional nail polish dryer. It provides you with a professional quality manicure and pedicure of high level at your own comfort. It is different from traditional UV nail lamp, besides UV nail glue as it can be used for drying all other different brand of nail gel.. 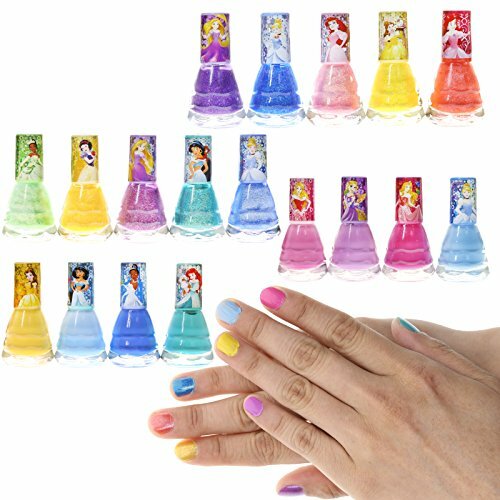 Using 33pcs high quality LEDs, your nails will dry faster, look shiny and without any lingering odor. The lamp can be set to 10s, 30s, 60s and 90s low heat mode. Enjoy comfort and luxury as you do your manicure at the comfort of your home or office. Get the treatment of being a Queen in your own home when nailing as you Do It Yourself (DIY) on your own. It also meet all needs of a professional nail salon. Customers would love and the experience of Sun2 . Circular Arc design, larger inner space with detachable base, enough for nail and toe nail drying. Please don't cover auto-sensitive led with gel. Painless schema design: Flexible Drying Options with 4 preset time control: 10s, 30s, 60s and 90s low heat mode, Enjoy professional quality nail polish at home. -TRENDY NAIL ART. 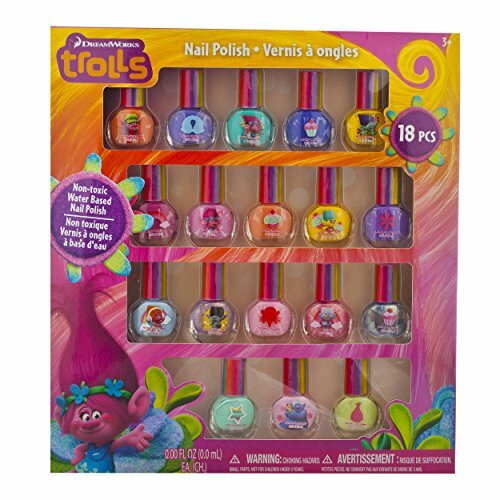 With this all in one nail extension gel kit, save your time and money for nail salon, and you can create various ornate and beautiful extension nails or other nail art design. Just bring your nail salon home. -QUICK CONVENVIENT & EASY USE -- Makartt nail extension gel dry very fast, the curing time for the LED lamp is only 30-60s and UV Lamp is 2 mins. It's stronger, more flexible , easier to control than other nail extension. It's lighter than acrylic or UV builder gel, when you do the nails, it seems like you wear nothing on your nails. It makes your nails look natural, with pretty length and neatness. -LONG-LASTING EFFECT & TIPS -- Makartt nail extension gel nails will last up to about one month or longer with proper nail prep (filing, buffering, and cleaning ). For the better adhesion, you can also apply nail dehydrator and primer which can last the nail much longer. What's more, you can refill your nails about every two weeks when the new cuticle area grows. 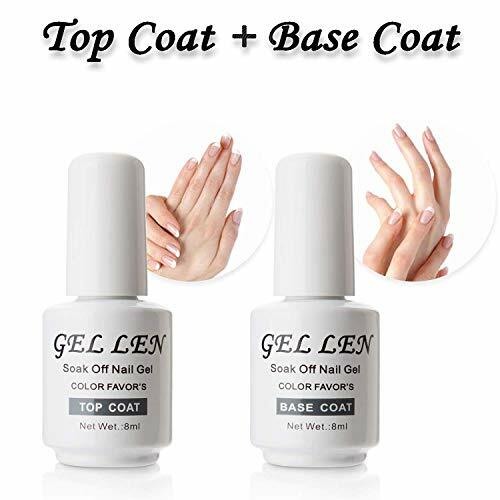 -WARM TIPS & REMOVE TIPS -- For preventing the gel sticking to the brush or other nail extension gel tools, you can dip the brush in slip solution (not included in this kit ) or 70% rubbing alcohol , so the nail extension gel can be picked and formed on dual forms smoothly. If you want to change the nail art style and remove the nail extension gel, you can file the nail extension gel down and then buffer it. A nail drill machine will save your time and help to remove faster and cleaner. Did you ever felt your eyes uncomfortable when using the purple light source nail dryer? --Never mind! 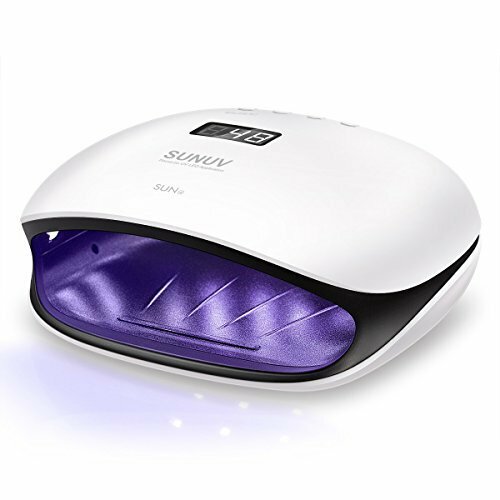 SUNUV SUN9C white light source nail dryer brings you safe and comfortable experience! --Here comes a good news! 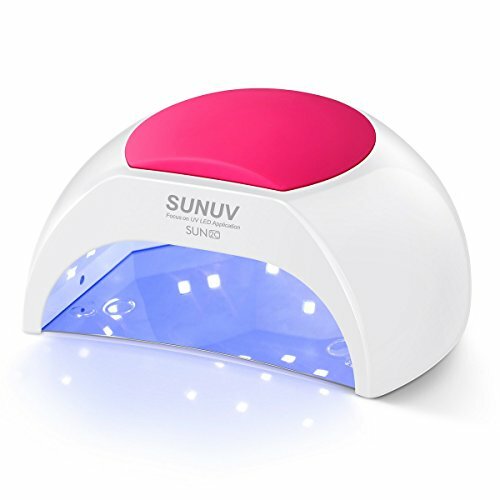 SUNUV SUN9C nail dryer with 15 pieces 24W double light source UV/LED(365nm+405nm) lamp is a professional nail dryer that has no need to change any lamp bulb! Did you ever found your skin become burned after curing your nails? --It's doesn't matter! 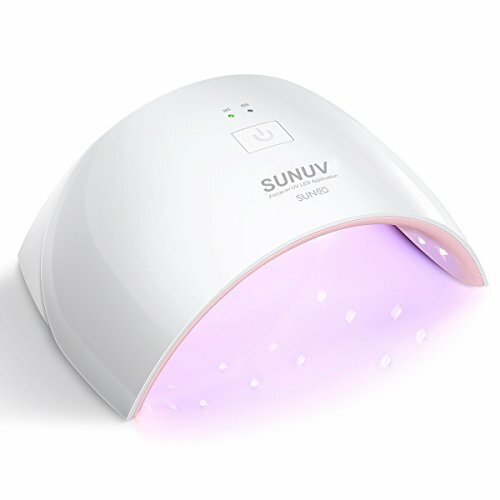 SUNUV SUN9C nail dryer's 24W low wattage design prevent dryer from overheat and protects your tender skin from being burned. THEN LOOK NO FURHTER, BECAUSE SUNUV SUN9C NAIL DRYER BRINGS YOU THE NAIL CURING SOLUTION! 5.MUTIFUNCTIONAL AND AJUSTABLE: For curing fingernail or toenail and with automatic sensor for curing 99s or 2 timing setting 30s/60s. Let's enjoy nail art at anytime and anywhere! WHAT IS GERSHION Nail Gel? GERSHION is the latest innovation in industry, one of the greatest nail enhancement product to hit the market this year. It is a combination between hard gel and acrylic, it is super strong and easy to use at home. All our orders are processed fulfilment by amazon. Gershion unique formula delivers super strong and flexible nails that you can count on. Once applied, the gel is light on your nails and stronger than other gels. If you enjoy changing your polish like you change your underwear, no problem. You can apply a regular polish over Gershion NailGel and change the color of your polish. Removing polish with acetone will not damage or compromise the NailGel. For any Pre-sale and After-sales problems about Gershion products, please contact Gershion Professional Customer Service Team, we are always standing by for you. 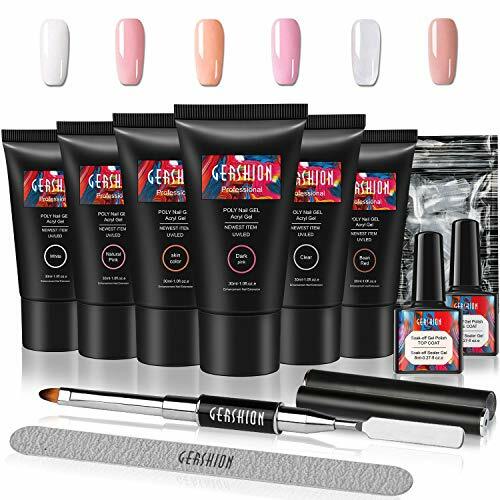 Gershion Acry poly nail Gel is an amazingly easy product to use and is a great alternative to both Gel and Acrylic. AcryGel can be easily manipulated into any shape you wish and you won't be rushing against setting times or chasing runny gel around the nail. Instructions: Prep your nail by buffing, pushing the cuticle back and applying dehydrator. Apply a thin and even layer of Gershion Base Coat and cure. Squeeze the required amount of Acry poly nail Gel from the tube, slice off the product with a gel spatula and apply to the nail. 3. Easy to used: Using a brush dampened with Gel Residue Wipe Off Solution pat the product into the shape and place desired. Cure for 30-60s in LED/ 2 mins UV. Refine the shape with a file, remove any dust and then apply a thin, even coat of Gershion Base Top Coat. Removal: Soak a lint free pad in Pure Acetone, place on top on nail and use Soak Off Finger Clips to attach it to the nail. Leave to soak for 10-15 minutes. Remove clips and use an Orange Wood Stick or cuticle pusher to gently remove the Acry Poly Nail Gel from the nail. Gershion unique formula delivers super strong and flexible nails that you can count on. Once applied, the gel is light on your nails and stronger than other gels. If you enjoy changing your polish like you change your underwear, no problem. You can apply a regular polish over Gershion NailGel and change the color of your polish. Removing polish with acetone will not damage or compromise the NailGel. High-speed bearings, low heat, low noise low vibration. 3.How to use it properly? The package includes the User Manual, please kindly read the manual carefully before using it . (1). Insert the handpiece flex plug into the power output socket on the main control machine . (2) Loose the chuck by left-turning the Middle part on the hand-piece and insert/change the Bit and tighten the chuck by right-turning the Middle part on the hand -piece. (3) Plug the controller into appropriate power source. (4) Choose the mode "FORWARD" or "REVERSE" direction, and then open the total power switch to start the machine. (5) Rotate the feed rate knob that you need by sliding the speed control handle. 1. 0-30000 RPM Continuously Variable Speed Switching. 2.Forward /reverse rotation options, pause 2 second to protect motor. 3.High -Speed bearings ,low heat, low noise ,low vibration. 4.Twist lock chuck, replace grinding head easily. 5. The coaxality is 0.02mm. 6. The LED display will shows speed signal according to the velocity change. Low Heat-Low Vibration-Low Noise: Adopt Japanese CE Certificate bearings, Makartt nail drill hand piece with high precision & high torque, truly achieve low noise low vibration and low heat. Design with ventilation for reducing the hand piece heat.Optional speed (0-30000rmp)which are easy adjust and shows speed signal on motor. Meet your multiple manicure from simple trim to remove builder gel nail. Reliable & Certificated Nail Drills: Makartt JD700 nail drill is launched in 2015 and has been always acclaimed by customers for durable quality and easy operation. More than 100,000 nail technicians or nail lovers have accumulated so far.It was upgrade not less than five times to ensure easy use and comfortable experience for you.No matter you are nail technicians or beginners, you deserve this professional makartt nail drill for comfortable experience. Multi-Functions: Makartt acrylic nail grinder is used for buffering, grinding, sharpening, sanding, polishing for acrylic Nails, remove extension gels, artificial or natural nails and cuticle remover. It can fit for the 3/32 drill bits. 30pcs high quality sanding bands are also included,what's more, we also provide foot pedal function, you can choose hand or foot mode for your convenient. Easy for Beginners & Home Use: We provide a tutorial video and instruction manual to assist you for use. Twist lock chuck system help you replace grinding head easily. Easy to get a natural nail prep and remove nail gel quickly. Change your nail shape nail art at anytime. Low cost but with salon quality. Ideal for professional nail salon, studio and home use. Must have a reliable&certificated nail drills for acrylic gel nails in 2019. QUALITY GUARANTEE & PROFESSIONAL SERVICE:Makartt offers a 1-year return & refund commitment on your nail drill. For any Pr-sale and After-sales problems about Makartt products, please contact Makartt Professional Customer Service Team, we are always standing by for you.We will be responsible for any product problem and assist you in finding a solution promptly. Starting a new chapter in all kinds of gel nail polishes curing, with 2X faster technology, superior intelligentized, user friendly and even more. All squeezed into a streamlined, salon-ready SUN4 nail lamp. THEN LOOK NO FURHTER, BECAUSE SUNUV SUN4 NAIL DRYER BRINGS YOU THE PROFESSIONAL NAIL CURING SOLUTION! *Suitable for curing all kinds of UV and LED nail gel polishes. * No need to replace any light bulbs. *Cures 5 fingernails or toenails at the same time in many ways. 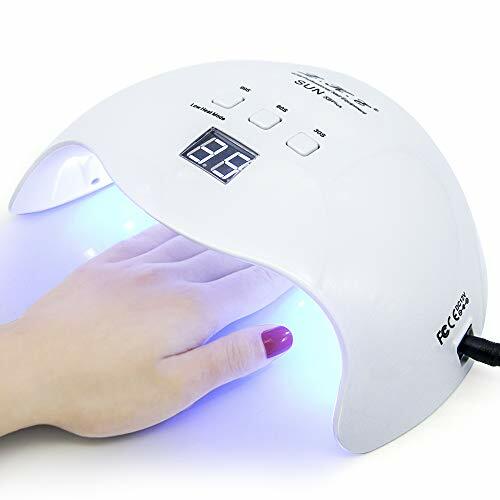 4.ADVANCED CURING TECHNOLOGY: Double Power button offers cure speeds up to twice as fast as standard UV LED nail lamp-a full cure takes just 30% of traditional nail lamp. PUEEN Latex Tape protects your skin from stamping, gradient and marbling messes, making cleanup a breeze. Or use it as a stretchy, flexible peel-off base coat, for those chunky glitter bombs. 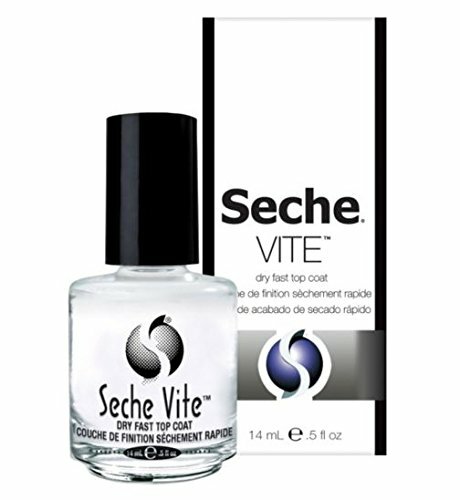 It's also fantastic for swatchers who need to remove polish quickly without the use of acetone between photo shots. PUEEN Latex Tape has a mild ammonia odor which will go away once it's dry, dries quickly, peels up in ONE PIECE, and it will turn clear pink when it's dry! Our Latex Tape is just fun to use. 1. Apply to areas where you want free of polish. 2. Allow to dry for 1-2 minutes until it turns clear pink. 3. Now be creative and do your nail arts (stamping, gradient, marbling or etc.). 4. Rub edge of Latex Tape with your finger or tweezers and peel it off. Apply, let dry and peel off! Open up your own nail bar and get creative with your friends. 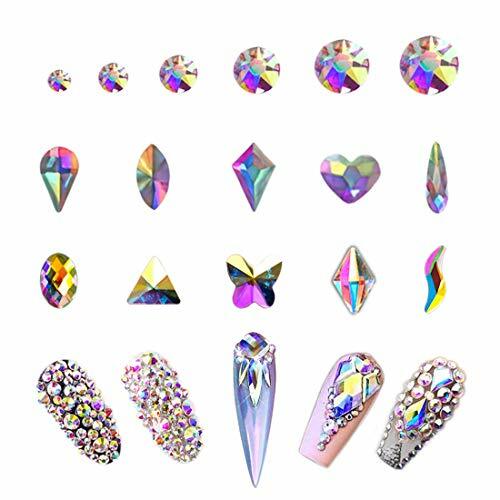 Experiment with different colors, patterns, gems and stickers and create impressive nail designs in minutes. Our easy to use '3 in 1' nail art pens make it super easy to paint, dot and draw in your chosen colours, finishing off with sparkling nail gems or cute stickers. It couldn't be easier or more fun! EASY TO USE '3 in 1' NAIL ART PENS which break into 3 sections to paint, dot & draw in 4 colors including beautiful NAIL ART GEMS! TOP COAT & POLISH SEPERATORS included for that professional touch. 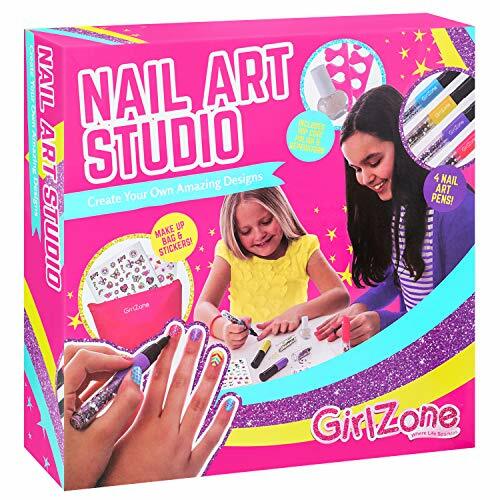 GREAT GIFT FOR GIRLS aged 6-12 +years old. 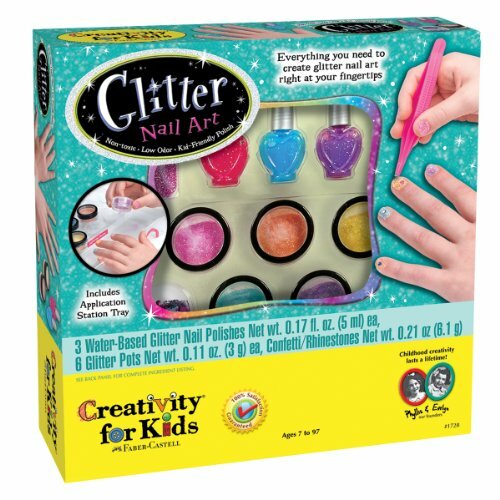 Youngsters can have hours of fun creating glitter nail art with this fabulous kit. Creativity For Kids has designed this kit to provide colorful, easy to use and safe ingredients in order to stimulate and encourage kids natural creativity. 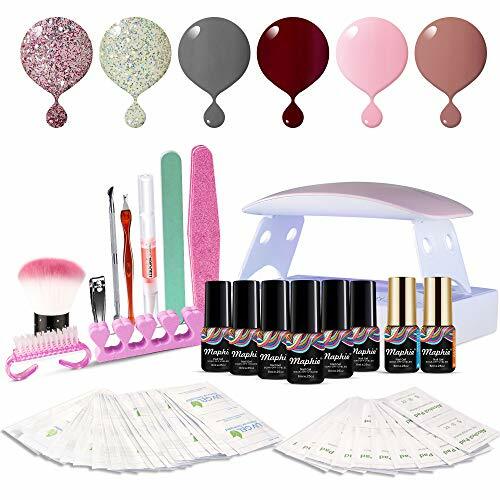 Included in the kit are 3 water-based glitter nail polishes, 6 glitter pots, a variety of confetti and rhinestones, a sparkly emery board, plastic tweezers, a brush, a storage bag, an application station tray and printed instructions and ideas. With these ingredients a youngster can polish their nails, sprinkle glitter on them and apply accents to create a bright, personal design. Cleanup is quick and easy with water. The kit is provided in a colorful box with a clear, plastic window to show off some of the materials and it makes a great gift. Why can ULGAI provide premium quality Crystal AB Rhinestones with even lower price than most vendors? ULGAI has been specialized in manufacturing and processing copper, crystals and nature healing stones for more than ten years. No middle man, no mark up. We sell directly to you online. With low overhead and our direct manufacturing capacity we can offer customers higher quality rhinestones than most retails, and still sell it for a fraction of the price. How can I check the MATERIAL of ULGAI AB Crystal is not plastic? Should I concern about the blackening and fading problems? Will ULGAI Crystal Rhinestones keep shining and sparkling? Whether will crystal ab rhinestones turn black or fade depends on the quality of raw material and the processing afterwards. ULGAI Crystal Gems are made from high quality K9 Glass which is pure, solid and transparent. Multifaceted surface and the coating outside are cut and processed delicately via sophisticated techniques, which aims to ensure durable sparkling. Besides, genuine gold or silver plating of flat or pointed back helps to enhance reflective brightness, which is incomparable by other low cost products. 2. Jewelry making, setting and embellishing of your clothes, shoes, purse, bags, etc. 3. Creations at scrapbook and other DIY craft works, home decor etc. Glue is not included in the package. EXCELLENT QUALITY Made from high quality K9 Glass which is pure, solid and transparent. Via special steam treatment, the AB coating is bonded firmly to the outer surface of each crystal bead with durable sparkling and brightness. Genuine gold / silver plating of flat back helps to enhance reflective dazzling. COLOR Crystal ab, iridescent, aurora borealis. Beads with AB coating act like a mirror while reflecting a rainbow of colors. WIDE APPLICATIONS Perfect ab rhinestones for crafts, nail art, clothes, face, shoes, jewelry, etc. GUARANTEE If you are NOT satisfied with ULGAI flat back rhinestones or have any other question about the product, pls contact us, we will try out best to solve your problem. 30-day money-back guarantee is provided unconditionally. Want to have a salon level experience at home? You need Terresa Nail Dryer. 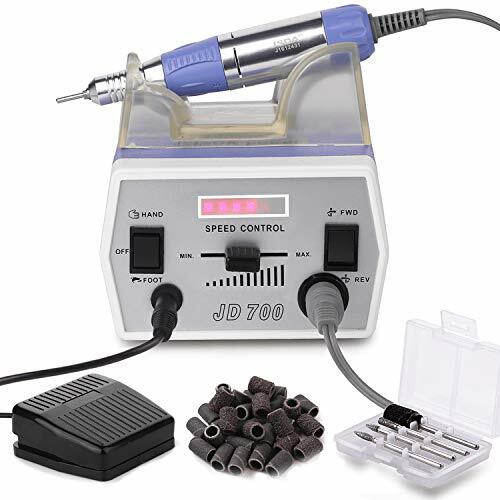 We devote ourselves to making a professional and helpful curing lamp, for anyone wanting beautiful and shinning nails. Who know your demand? Terresa is focus on healthy and green lifestyle for you. Terresa is a brand team that full of passion and vitality, we are committed to research and development production better and better product. Why you need Terresa Nail Cure Light? This gel nail dryer kit has multiple functions. You will get the 2X faster curing pleasure from Terresa upgraded 72W acrylic nail dryer. The surface of the pearl paint makes it difficult to scratch and easy to clean. Thanks to its bigger body design, it can cure 5 fingernails or toenails. Smart 2.0 automatic design makes it convenient for you to use it. 3 low heat mode timer setting allows you to enjoy it without any heat and pain. You don't have to worry about replacing the light beads because of its 50000hrs long-life lamp beads. Terresa gel curing lamp is the best choice for Salons and Families. 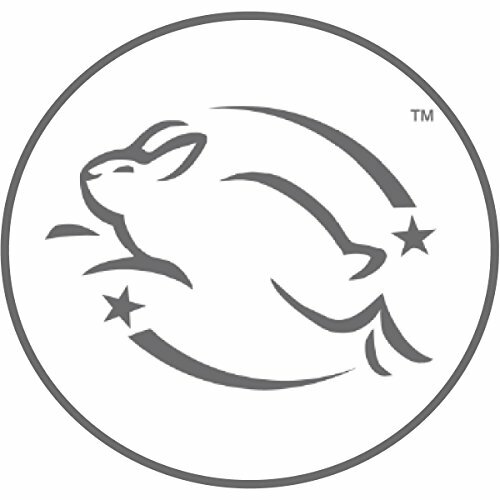 Terresa brands are not only focus on quality but also customer service. We focus on every details not only on production, but also quality inspection. Terresa are under 1% defect rate. In addition, we are always improving our bands by listening to You. Your satisfaction is our greatest pursuit, your happy shopping experience is our biggest harvest. Terresa brands are under long-term warranty. All Terresa brands are under 12 month's warranty. If there are any problems, we could offer a full Refund within 360 days. 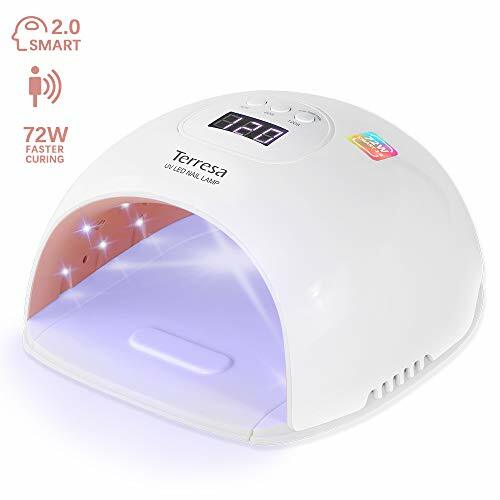 72W ADVANCED CURING TECHNOLOGY: You can enjoy 2X faster curing when using, as Terresa nail polish dryer uses UV and LED dual light power buttons. And shorten your curing time by 50% comparing with traditional nail lamp. PROFESSIONAL ALL-IN-ONE GEL CURING MACHINE: With 36pcs UVLED combined lamp beads are distributed to dryer your nail evenly. 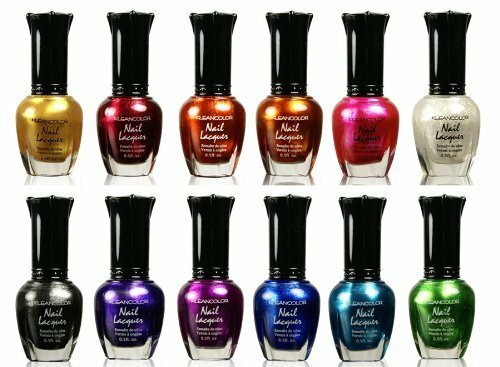 Which means that you can get your beautiful and shinning nail as it works well with All types of UV gel and LED gel nail polishes. SMART 2.0 MEMORY DESIGN: The UV LED nail lamp uses the smart system make it more convenient and user-friendly. Auto-sensor for on/off without pressing any keys. 3 Timer Setting (30s 60s 120s- Low Heat Mode), large LCD screen to show curing time and removable bottom tray. 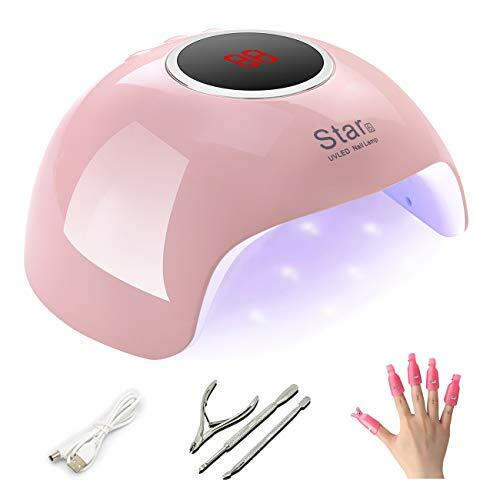 IDEAL SALON EFFECT AT HOME: The professional nail cure lamp uses sunshine nail to protect your fingers and eyes, the bigger body designed for curing 5 fingernails or toenails. You can get the effect like salon nail at home. 100% SATISFACTION GUARANTEE: You can rely on Terresa service of 30 Days money back guarantee and 12 month manufacturer's warranty. If there are any problems that are not satisfactory to you, please contact us immediately and our friendly customer service team will work hard to put a smile back on your face. No Wipe , 9 Toxin Free formula, easy and safe to apply. Flexible gel top coat avoids nicks, chips or smudges. 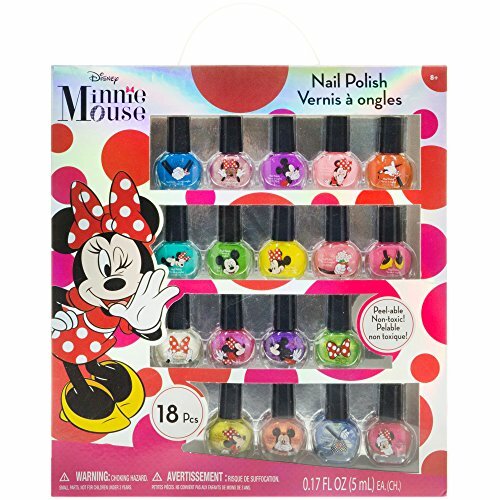 High Compatibility with ALL BRANDS Soak-off Gel Nail Polish. 1. Preparation: Trim, file and buff nails for a clean surface. *Before opening the bottle, roll the bottle between your hands back and forth to gently mix. 2. Base Coat: Apply thin base coat, cure under UV/LED lamp for 60 seconds. 3. 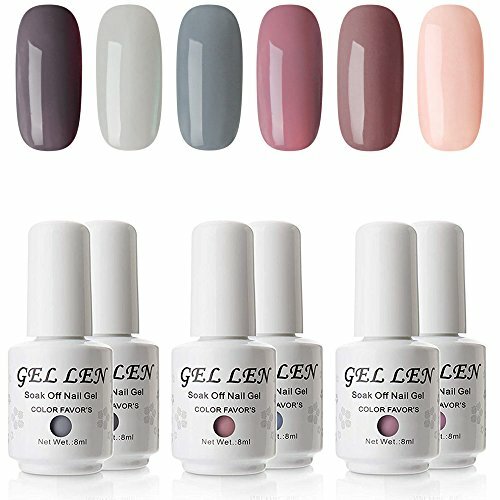 Gel polish: Apply first thin layer of color gel polish and cure under UV/LED lamp for 60 seconds. Apply the second or third layer color gel polish. *When applying color, wipe excess gel with brush before applying strokes. 4. Top Coat: Finish off with a layer of top coat, cure under UV/LED lamp for 60 seconds. 3. Apply gel to the edge of each nail to seal the gel and avoid chipping. 4. Soak for a minimum of 10 minutes. Healthy UV Top Coat: 9 Toxin Free Ingredient makes it healthy and low odor. 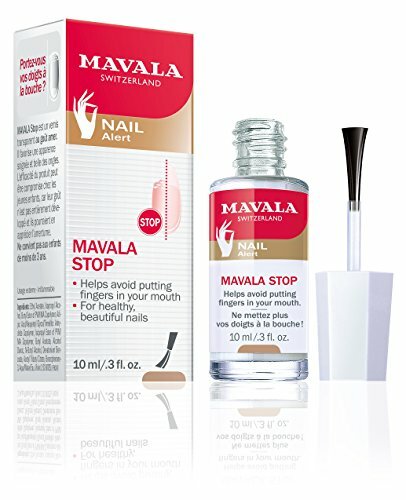 No harsh ingredients or adhesives that lead to damaged nails. Reminder:No need to wipe the base coat's tacky residue off. This will help the color coat stay on your nail longer. If you experience any problems using this product, please contact us directly. We guarantee a fast replacement or refund service. Noted: The power adapter does not included in accessory list. Step 3.Apply base coat first, cure with UV(1 minutes)/LED nail dryer lamp(30 seconds). Help for the long lasting. SAVING MONEY :Stop wasting your money on salon.Enjoy the fun of DIY at your pleasure. MINI NAIL DRYER :Easy to use -- It comes with Micro USB-Cable.You can use USB computer interface,USB charger plug or power bank to make it work. ABOUT SERVICE Customer satisfaction is our unceasing pursuit. If you have any problems in our product, please feel free to contact us. 1.Rapidly Dryer Safer and quicker than LED nail lamb, can fastly cure gel nail, 24W UV machine strongly dry out.Do not make your skin suntan. 2. Intelligent Sense: Hand nail dryer can sensitively react your move withn your hand infrared induction and automatically work wheare into the machine. 3. Specific Function: Gel nail polish have Time-Memory, 3 mode you can choic30s 60s 90s , and infrared induction.Let you much easier use it. 4.Easy to Carry: UV nail lamp, you can easily carry it , whenever and wherever use it. 5. Warranty Guarantee: We guarantee 1 years warranty guarantee to make a replacement or refund during 30 days.